Many moons ago there existed an app called DropScript Backgrounder. It allowed you to turn an AppleScript application* into a background process, that’s to say it would be hidden from the Dock and Force Quit menus. It can be helpful, for example, if you want a stay open app to run unobtrusively in the background without disturbing the user. Unfortunately, DropScript Backgrounder no longer seems to be available so we’ve created our very own Script Backgrounder to fill the gap it has left. You can get your copy from the Mac App Store. * An app created in Script Editor and saved as an application. We’ve just released OnScreen Barcode Scanner (yep, it took us ages to think of the name). It lets you scan a barcode that you have on screen and determine the type and encoded number. It’s a useful tool for QA checks, or for confirming that the bars on the code really do represent the digits below. 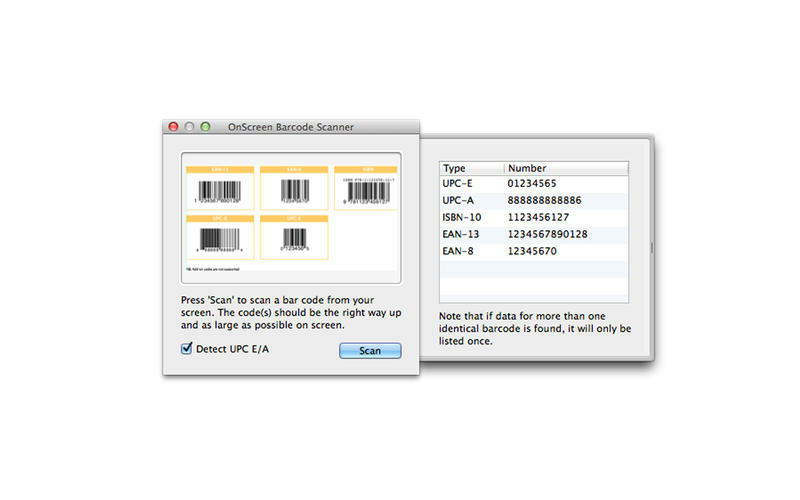 • OnScreen Barcode Scanner supports UPC-A, UPC-E, ISBN, EAN13 and EAN8 codes.